The Disney Princess Castle is adorned with Jasmine, Snow White, Cinderella, Belle and Aurora. 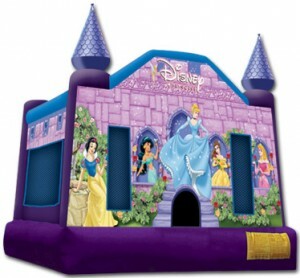 Your princess will have a blast while being accompanied by their favourite characters. This is the perfect party accessory to complete your Disney princess party. Rent today and enjoy the magic of Disney with this inflatable.